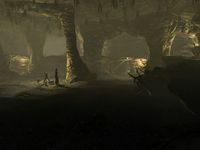 Glenmoril Coven is a cave far to the northwest of Falkreath inhabited by a group of unique hagravens, the Glenmoril Witches. There is only one zone. When you approach the cave it becomes clear that all is not well. All the local plant-life is dead, and there are mutilated shrines along the path to the cave. The path leading here starts immediately to the north of an unmarked ruined tower and has a number of switchbacks as it climbs towards the cave entrance. You are likely to encounter a creature or two along this path. As you near the top there are numerous hagraven symbols formed from the bones and antlers of large elks, spriggan and goat heads on stakes and taproots hanging from trees, leaving under no illusions of what you're likely to face within. There is a patch of mora tapinella growing on a dead tree stump near the entrance and several troll and animal skulls either side of it. The entrance is marked by lit braziers on a stands. After entering, there is a novice-locked chest, which is in an alcove straight ahead where the tunnel first turns to the right. There are three enemies in the large chamber nearby. A hag patrols near a campfire in the middle, and there is a leveled creature to the right, hiding in the darkness. There is an additional weak creature by the western tunnel on the upper level. There is a goat hide next to the central pillar and another just to the northwest. Due south of the fire is a large coin purse, a basket holding a sprig of elves ear, and two nightshade flowers, a pair of ragged robes next to a patch of bleeding crown fungus, and two skulls to go with the two nearby rib cages. There are ramps leading upwards on either side, and four tunnels leading out from the center room: two on the lower level and two on the higher level. The northern tunnel on the lower level leads to a small room. Where a hag is standing on a stake studded ledge on the left. An earthen ramp leads up to it starting behind a rock pillar in front. There is a food barrel with a lit goat horn lantern on top and to the right is an open crate containing two rock warbler eggs and a briar heart, with a bird's nest beside it holding another rock warbler egg. Further to the right is an unlocked wooden chest. The twisting tunnel to the west on the lower level leads to a small room with a waterfall. There is a single hag by the waterfall on the lower far side of the chamber and nothing else. The tunnel to the north on the upper level leads to a medium sized room. After following the tunnel, turn left to go around the stake studded edge. There is a creature at this point and a hag further on, near a table with an arcane enchanter built-in. On the table is a dead goat, a goat's head, a bowl of troll fat, and a copy of the Enchanting skill book A Tragedy in Black. Before the western tunnel on the upper level, there is a patch of Namira's rot on the left and another on the right inside the tunnel. There is also an iron ore vein in the tunnel, on the left-hand wall after turning the corner by the brazier. The passage opens into a chamber dominated by a shallow pool with a path around it to the right. 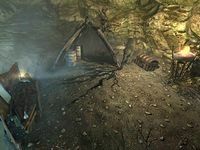 There is a leveled creature around the corner and a hag on the far left side standing in front of a hagraven-style tent. There is another Namira's rot and a bleeding crown on the right. Across from these sits another pillar, behind which is an open crate containing two slaughterfish eggs and three slaughterfish scales. Beside the tent is a bloodied altar with a random poison, one of three random potions (a potion of minor healing, potion of minor magicka, or potion of minor stamina), and a nightshade flower. On the other side of the tent is a boss-level unlocked chest. Inside the tent there are two barrels of ingredients and an open crate containing a copy of the Destruction skill book Horror of Castle Xyr, two more slaughterfish eggs, and three more slaughterfish scales. By another pillar at the southern end of the pool are three white caps and a bleeding crown. You can read more about the history of the Glenmoril Witches in the Lore article. The cave does not normally respawn. However, there is a small exception to this: during Blood's Honor, the hags will be replaced by living, unique hagravens. Nothing else respawns, so you cannot pick up two of the skill books or double the ingredients. There is no difference in the cave when the Glenmoril Witches are here as opposed to the hags. The bloodied altar in the upper west chamber is a shrine to Hircine. 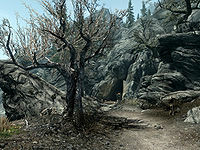 If first visited during Blood's Honor, this location will not be marked as cleared. This page was last modified on 24 March 2017, at 05:31.